The Kaye Edmonton Clinic and the Fort Saskatchewan Community Hospital will be test sites for a project looking to improve the efficiency of large commercial buildings, reducing GHG emissions and energy costs. This is just one of 11 projects focused on innovative clean energy and water technologies receiving $28.8-million in joint federal and provincial support. For the first time, Alberta Innovates (AI) and Emissions Reduction Alberta (ERA) are combining efforts with Sustainable Development Technology Canada (SDTC) to fund technology from small and medium enterprises that enhances environmental stewardship and supports economic development in Alberta. The 11 projects are expected to create 300 new jobs. ElectroChem membrane system project includes the design, build and pre-test of field pilot plant to confirm the design, operating needs, economics, benefits, and lessons learned for full-scale commercial dispatch. High frequency pipe scanner measures thickness, map defects, detect voids outside the pipe and can report to the surface in real time via fiber optic tether. Pilot trial readiness of new forward osmosis technology that aims to improve economics in the treatment of saline waste streams. Demonstration of ElectroPure Technology at a thermal in situ facility to test economic, environmental, and physical footprint benefits. Project uses a combination of technologies that can detect upsets in water treatment and enable operators to adjust the process as needed. Combination and enhancement of water treatment technologies for hydraulic fracturing applications to reduce the use of fresh water. Combination of a series of water treatment steps to remove contaminants; each step operates at commercial scale in other industries, but have not been applied commercially for this application or in this combination. ERA and SDTC are committing up to $22.6 million to four projects. The technologies support energy efficiency and conservation, new and better uses of carbon dioxide, methane reduction and cleaner energy production and usage. Purlucid’s technology aims to reduce GHG emissions during in situ bitumen recovery by allowing water treatment to occur at a higher temperature. Energy Optimization Software (EOS) reduces GHG emissions and energy costs by optimizing the way heating, cooling, ventilation, lighting and other large functions are maintained. Development and scale-up of Near Zero Emission Well Control System, a solar-electric system that eliminates pneumatic equipment at remote off-grid well sites. Commercial scale pilot test of patent pending RF XL electromagnetic heating technology designed to efficiently mobilize heavy oil and bitumen. Over 175 submissions from small and medium-sized enterprises (SMEs) were received through two separate competitions, ranging from prototype development, field pilots and commercial scale demonstration projects. The companies selected for support are from across Canada, but all technologies are being tested in Alberta. Projects are required to secure a minimum of one-third of the total funding for any project from non-government sources. These two joint-funding programs invited submissions from organizations incorporated and operating in Canada with less than 500 employees and less than $50 million in annual gross revenue. Each funding process offered applicants a streamlined, harmonized model with one window of access to two pools of money. The funds available are more than applicants could get through the organizations individually. This is the first time the organizations have worked together to allow companies to access funding through a single application process. 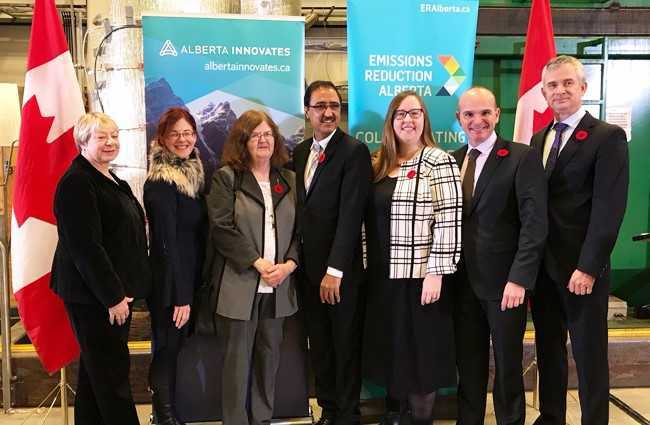 (From L to R) Our CEO Laura Kilcrease, President and CEO of SDTC Leah Lawrence, MLA for Edmonton-Mill Creek Denise Woollard, Canadian Minister of Infrastructure and Communities Amarjit Sohi, Minister Gray, Jim Balsillie and CEO of ERA Steve MacDonald.